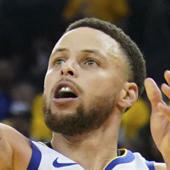 OAKLAND, Calif. — En route to the NBA’s first 73-win campaign last season, the Golden State Warriors made history by clinching a playoff spot on Feb. 27. Less than a year later, the Warriors beat themselves. On Saturday, Feb. 25, the Warriors punched their ticket to the playoffs with an 112-95 victory over the persistent Nets, which means they broke their own record for the earliest playoff clinching date in NBA history. At 49-9, the Warriors don’t have a better record than last year’s team, which clinched at 52-5. They’re not chasing history this regular season and were never in danger of missing out on the postseason. So, booking a playoff spot is nothing more than a formality. It doesn’t really matter. Even before the Warriors landed Kevin Durant in free agency, they were already the best team in basketball. With Durant, who missed Saturday’s game with a pinky injury, anything less than a championship will be a failure. But that doesn’t mean what they did Saturday night should be overlooked. Steph Curry, who missed the playoffs in his first three seasons, knows that much. There wasn’t a celebration Saturday, according to Steph, and he was the first to mention the feat to the rest of the team. In the Steve Kerr era, it has been far too easy to take for granted what the Warriors are doing. It’s easy to shrug at Saturday’s accomplishment and ask, Well, isn’t that what they’re supposed to do? By now, it’s normal. But keep in mind how crazy that sounds or would’ve sounded three years ago. The Warriors normalized February playoff berths. At some point, though, the Warriors are going to wake up from this dream and become just another team. Eventually, the Death Star will be defeated and we’ll all go back to living in a world where the Warriors don’t clinch playoff spots in February. Saturday serves as yet another reminder that what we’re watching is entirely not normal. It’s Feb. 25 and the Golden State Warriors are playoff bound. This is real life. Read on for more takeaways from Saturday’s game. For the first time since he joined the Warriors, Durant missed a game. It was a good one to miss, as the nine-win Nets didn’t pose much of a threat. If anyone thought the Warriors might lose without Durant, their fears were unwarranted. The Warriors are now 6-1 when their entire Big-4 doesn’t play, according to ESPN Stats & Info. On Saturday, Kerr went with rookie Patrick McCaw as the unusual starter. He also handed plenty of minutes (15) to James Michael McAdoo at the 4. With Durant out and Draymond in a shooting slump, the Warriors get PF points out of McAdoo. Who almost never plays PF. Of course. The lineups didn’t matter. The Warriors started hot with a 14-4 run, but the Nets battled back due to some sloppiness on the Warriors’ part. They even managed to take a brief lead with roughly four minutes remaining before halftime. And then the Warriors happened, building an 11-point advantage at the break. The run culminated with a vintage four-point play from Steph. The Nets made it sorta interesting late in the game, trimming the Warriors’ lead to eight with three minutes remaining, but the Warriors quickly put an end to the comeback effort. Clearly, this game was more about the Nets being bad than the Warriors being great. The Nets shot 8 for 28 from deep and every time they made some noise, the Warriors morphed back into the Warriors again. After, both Kerr and Klay talked about their struggles with ball movement, an issue that’s magnified when they don’t have Durant to bail them out, as Klay also noted. The scary part, of course, is that the Warriors almost always win even when they’re not moving the ball particularly well, which was the case Saturday. And when they do move the ball well, they’re unbeatable. On Thursday, the Warriors returned from the All-Star break by beating the Clippers behind a 50-point third quarter. In that game, Curry went for 35 points, Durant poured in 25, and Thompson added 18. The stars stayed hot. By halftime Saturday, Curry had already accumulated 17 points (four 3-pointers) and five assists. Thompson added 13 points on 5-of-10 shooting. Thompson finished with 24 points while Curry ended on 27. No other Warrior entered double figures. Draymond Green, who notched his 500th career steal, strangely didn’t see the floor all too much -- even with Durant out. Green was on the court for 23 minutes. He went 1 for 10. When Kerr was asked to explain Green’s minutes, he had a simple explanation. Meanwhile, Draymond wouldn’t comment in the locker room. In February, Draymond is shooting 38 percent from the field, so it really hasn’t been his month. When Javale McGee entered the game for the first time, he received a thunderous applause. The ovation likely had everything to do with what has been happening off the court. In case you’ve tuned out the controversy, McGee and Shaq find themselves caught in a bit of feud, which prompted Durant to defend their teammate, which resulted in Shaq calling out Durant on Twitter. We can sit here all night and debate if Shaq went too far, or we can simply acknowledge that McGee has carved out a meaningful role with the Warriors. Against the Nets, he didn’t finish most of his shots (3 for 10), but he did provide consistent energy. In a wild sequence in the first half, McGee rescued what had to be three loose balls from the Nets’ clutches. He couldn’t buy a bucket, but still, the crowd appreciated his effort. McGee also blocked Brook Lopez and shut him down on consecutive defensive possessions, one of which led to a transition 3. The crowd recognized his effort. When he subbed in for the first time in the second half, he -- again -- got a huge ovation. When he checked out, Oracle went wild. Suddenly, Mo Speights’ status as the fans’ favorite role player in recent Warriors history is in jeopardy. Wasn't covering the team on a day-to-day basis last season. Has JaVale surpassed Mo Buckets on Oracle's beloved scale for a role player? It’s not an easy question to answer, which says something. The Warriors’ roster is undergoing a minor renovation. Briante Weber’s second 10-day contract expired after the game and he won’t be signing another deal with the team. Before Saturday’s game, Kerr spoke highly of Weber, saying they’ve “really been impressed,” but also admitted that the team needs to “keep all of our options open.” After, Kerr -- clearly emotional -- revealed they let Weber go. On Saturday, ESPN’s Marc Stein reported that the Warriors would be interested in Jose Calderon if he secured his release from the Lakers. The San Jose Mercury News’ Anthony Slater reported after the game that the Warriors are expected to sign Calderon. So, Calderon appears to be their guy. That makes sense. Calderon, 35, has been in the NBA since 2005. Weber is 24 and has barely played. If the Warriors needed to pick one who would be more reliable in the playoffs, they went with the more experienced player who likely won’t get fazed in a big moment. The Warriors are about to embark on their most brutal stretch of the season in terms of scheduling. Kerr said before the game he didn’t have plans to rest any of his players, but of course that doesn’t mean he won’t. OK, let’s look at it then. From Monday to March 11, the Warriors will take on the 76ers, Wizards, Bulls, Knicks, Hawks, Timberwolves, and Spurs on the road. A March 8 date with the Celtics at Oracle will be their only home game in that span. At this point, the Warriors priorities are 1) clinching the top seed in the West and 2) making sure they enter the postseason rolling. That last part means continually improving their process (not just the results) and, of course, being healthy and rested come playoff time. Four games ahead of the Spurs in the loss column, the Warriors might experience a difficult juggling act in the coming weeks as they attempt to stay rested and wrap up the No. 1 spot.